This is an important accessory to our looseleaf registers if you have pre-authorized any businesses or organizations to charge your credit card account periodically. Also recurring charges from your credit card provider, such as monthly interest and annual fees, should be included on this list as well. It is advised that you create a separate list of your automatic credit card charges for each account using these looseleaf schedules and insert them into your checkbook cover along with the looseleaf registers for the same account. 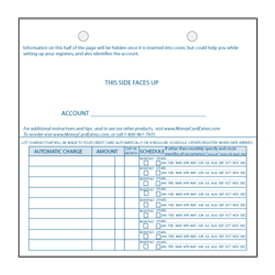 In many cases, one sheet per account will suffice, as one sheet provides 18 entries (9 on each side). Be sure that when the date arrives for an automatic charge that you enter the charge into your register, updating the balances accordingly. This way, you won't be blindsided by a charge you'd otherwise forget about and wonder why your credit card balances aren't what you thought they should be! These schedules are sold in packages of 25. Each sheet is two-hole punched for easy storage into a standard two hole binder using a standard size fastener (for your convenience, a fastener is provided free with the purchase of any looseleaf register 100-pack). See the video below demonstrating how these schedules integrate with our other looseleaf products within a single checkbook cover.